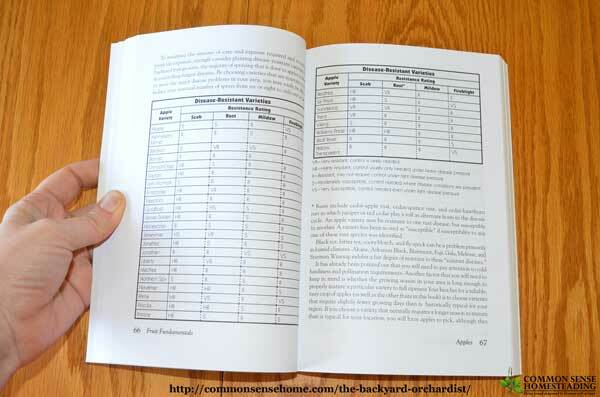 The BackYard Orchardist by Stella Otto is a nice overview of all things backyard orchard. Originally written in 1995, the second edition has been updated and expanded, featuring over 300 pages of Stella's fruit growing knowledge. It's an encouragement for the backyard grower to experiment with fruit varieties not readily available via the industrial food system. A word of warning – once you've enjoyed a perfectly ripe fruit, freshly picked from your own tree, you'll be hooked for life on growing your own. There are over 100 illustrations, tables and charts to help you find the right variety for your yard or garden, identify pests and estimate yields so you know how many trees to plant. There are also “Rules of Thumb” inserted here and there in the text to highlight important points, such as “Asian pears are best ripened on the tree, then picked. A change in skin color from greenish to light brown or yellowish-green signals approaching ripening.” This contrasts with Domestic Pears, which are typically best picked green and fully ripened off of the tree. I also enjoyed the Q&A “What's ailing your tree?” section in the appendix, which provides answers for many questions that are likely to be encountered by the beginning orchardist. The vision of fruit trees in every yard presented in the opening was also very compelling. Wouldn't it be a wonderful thing to have every neighborhood growing fresh, local fruit? 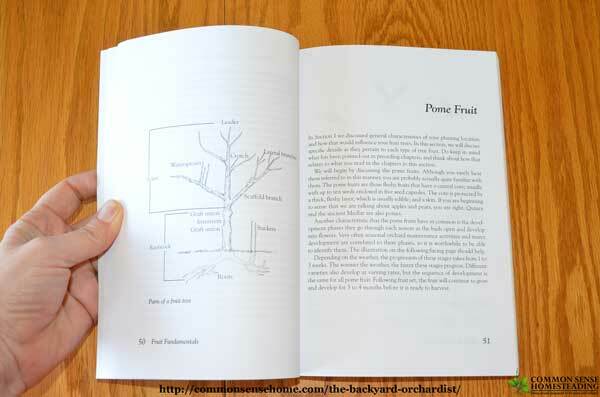 I felt that the detailed information on rootstocks was beyond most backyard growers, since many catalogs don't offer a choice of rootstocks beyond “standard, dwarf and semi-dwarf”. That said, the information would be useful for a more advanced grower. I would also have liked to seen some permaculture information included, since that's the direction my own plant growing has taken in recent years. There's no better time to start experimenting with your own backyard orchard, blueberries, raspberries or other fruit. Once established, most plantings take minimal time for maintenance – it's not that much different from keeping your lawn mowed, except you can't usually eat your lawn. (Unless you grow edible weeds, but that's another post.) Fruit trees are a great way to reconnect with our food supply – and they're beautiful from spring's first blossoms to the flush of fruit and winter's stark scaffolding. With container gardening, dwarf root stocks and self-fertile varieties, even the smallest yard can find room for a fruit tree. 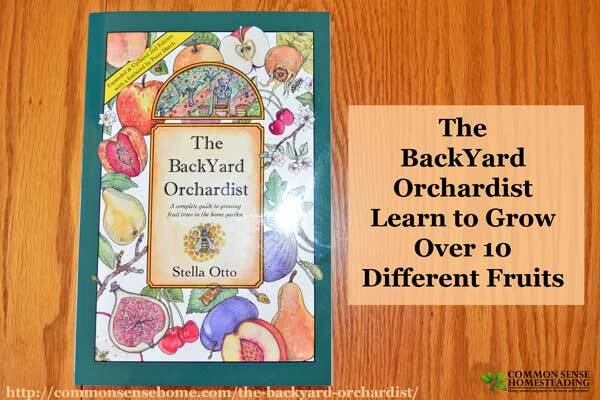 Stella Otto, author of The Backyard Orchardist is offering a signed copy of her book to one lucky reader of Common Sense Home. Enter to win by going to the Backyard Fruit Gardner web site and signing up to receive occasional fruit growing tips at the bottom of the home page. Then come back here. Tell me, via a comment, what you’d most like to learn about fruit growing and confirm that you registered for Stella’s growing tips. If you really don’t dig social media or registering to get gardening tips, just let me know. Fine print: One entry per person; additional entries will be disqualified. Open to U.S. residents only, due to shipping costs. The winner will receive one author-signed copy of The Backyard Orchardist. Contest is open until midnight EST, April 6, 2016. Winner will be notified by email and have 48 hours to respond and claim their prize or another winner will be chosen. 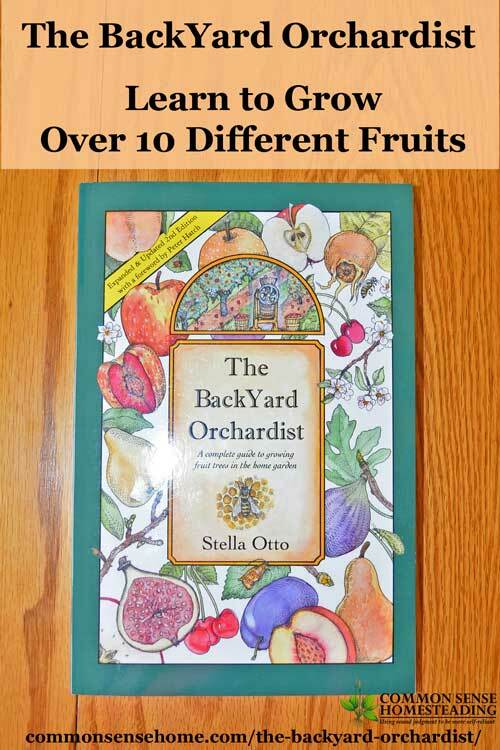 If you were not the lucky winner, but would still like to dig into a copy of The Backyard Orchardist and enjoy your own fruitful harvest, copies are available on Stella’s website (www.stellaotto.com). By ordering directly, you will receive a signed copy. You will also contribute to keeping a small, independent business thriving and able to provide the latest in fruit growing information. If none of that matters to you, unsigned copies are also available at booksellers nationwide and on Amazon. Fruitful gardening! I just moved to a 22 acre homestead and there are no fruit or berry plants here now. This book seems like a great resource as I get started. space for fruit trees I want to get started, but I want to know what I am doing. I did sign up for her newsletter. just getting started with fruit trees, the deer really like them-could use some help! Joined her mailing list as she knows her trees, and I could use all the help I can get. I have a couple that I have in pots, they are dwarf but eventually would love to have a orchard on our property. I registered for Stella’s growing tips. I would like to know more about keeping trees at a height that I can easily maintain and cover with netting. I do buy dwarf trees but they will still be too big. Have you tried super dwarfs? Many nurseries are now using super dwarfing root stock for container planting. I am interested in organic ways to control pests in fruit trees and symbiotic plantings. I would like to learn to grow organically and to identify pests and diseases. I signed up for Stella’s growing tips. Thanks! I already have several fruit trees. I would like to learn more about cherry trees. I don’t have any of those yet & how to protect new smaller trees from deer. Hi, I just signed up for Stella’s tips. As I am looking to make my little piece of dirt more productive and healthy, for the land and the family, this book would give me ( a total city girl) some awesome tips, pruning, harvest, pest, ect. Thanks for all the wonderful information you put on the blog. I happen to by one of the few people that really is not into the whole social media thing. Social media is a double edged sword. I’ve met some great friends online, but it can easily eat up a lot of time. looks like a great news letter and book – we are starting a new garden, so I’d love to know more about some of the fruits we haven’t grown before….. and looking forward to growing sour cherries again! I want to learn everything about growing fruits. One thing I really need to do is learn more about is making my orchard deer-proof.